The 2019 College Baseball Season is almost here! That means the start of the Chris Lemonis Era at Mississippi State, featuring a loaded roster with superstar seniors Jake Mangum, Elijah MacNamee, and Cole Gordon, returning Ace Ethan Small, an incredible sophomore class with returning starters Rowdey Jordan, Tanner Allen, Jordan Westburg, and Justin Foscue, and preseason All-American, not to mention first round MLB draft pick, freshman JT Ginn. On top of all of that, 2019 marks the opening of the fully re-done Dudy Noble Field. Needless to say, excitement and expectations are skyrocketing. To add to the excitement, Adidas and Mississippi State have tweaked the Bulldogs' uniform lineup for 2019, and it appears that State will have one of the most consistent baseball uniform lineups in program history. The 85-style and pinstripe uniforms both appear to be returning in 2019, but with a few small tweaks that bring consistency to the set as a whole. On the 85-style jerseys (maroon, white, and black), the sleeve stripes have been reduced from the large, thick stripes, which were accurate to the originals, to thinner stripes that I think will work better on a more permanent basis. Making the sleeve stripes smaller allowed for the addition of the M over S logo to the right sleeve, which is an addition I am a big fan of. This allows the M over S logo to still appear on the Bulldogs' primary uniforms, after both the white and maroon jerseys with the M over S logo on the chest have been phased out. Other changes to the 85-style uniforms in 2019 include the enlarging of the state of Mississippi outline on the back of the jersey, the inverting of the SEC patch on the maroon and black jerseys, and the movement of the Adidas logo from the right chest to the left chest. Adidas seems to be moving its logo to the left chest in all sports; there was a very similar change to the football uniforms with the PrimeKnit A1 template this past fall. In football it doesn't really matter which side the Adidas logo is on, but in baseball it can cause a problem with jerseys that feature the team logo on the left chest. This is one of the reasons that the maroon M over S jerseys were only worn twice last year; having the Adidas logo right above the M over S caused it to be smaller and the jersey to look unbalanced. While its fine for now, if we ever want to bring back the maroon or white M over S jerseys, I hope Adidas will be open to moving its logo back to the right chest. The black 85 jerseys will see a bit of a more significant makeover than the white and maroon versions. In addition to the undergoing the same changes as the other versions, the 2019 black 85s will feature maroon accents, differentiating them from the 2018 versions that featured absolutely no maroon. Maroon is include inside the stripes on the collar and sleeves, inside the SEC patch, and outlining the front wordmark, back numbers, and M over S sleeve logo. The final major change to the black 85s is the addition of the player name on back in place of the state of MS outline. For the past two seasons, no Mississippi State baseball uniform has featured player names; the 2019 black 85s will be the first since the 2019 White M over S jerseys to do so. The white "State" pinstripe uniforms will also see some small changes in 2019, all similar to those to the 85-style uniforms. A larger state outline, the Adidas logo moved to the left chest, and the M over S logo on the right sleeve. The pinstripes actually already had the "thin" M over S logo on the right sleeve; the 2019 versions feature the same thicker version featured on the 85-style uniforms, creating a nice consistency between the two different uniform styles. In early January, D1Baseball.com's Kendall Rogers tweeted out a pictures of several new Adidas uniforms from an Adidas preseason event he was attending. 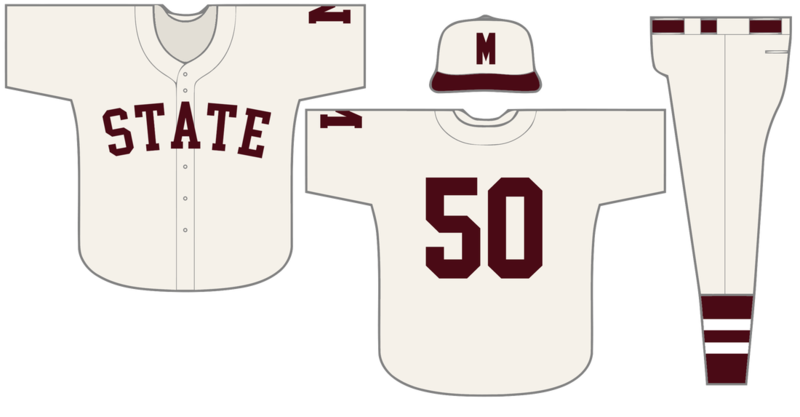 The Mississippi State uniform was a brand new road gray look inspired by the uniforms worn from 1950-1958, with a block "STATE" across the chest and a block "M" on the right sleeve. A few weeks later at the unveiling of the new Dudy Noble Field locker room, a white version of the 50s-style uniform was on display, along with the updated maroon 85s and updated black 85 jerseys in the all-black combo. It's worth noting that we have not seen the backs of either 50s-style jersey. It's possible that they could feature player names on the back like the new black 85s, though the original 1950s uniforms did not. Along with seeing the updated white 85s a few times and updated pinstripes at fan day, these 6 uniforms appeared to comprise Mississippi State's 2019 uniform lineup. FYI, this is incorrect. All of these uniforms have not been confirmed. ​One or both of the 50s-style "State" jerseys are just prototypes. Hobart was referring to the inaccuracies of the black 85 mockup at the time (such as the lack of player NOB). If you've read my articles or tweets before, you probably already know that I'm hoping for the latter. I listed the all-black combo with the others because the updated black 85s were shown in that combo; it's possible that they were shown off that way as a nod to the success of the all-black look last season, and not as a sign of things to come this season. It's also possible that the gray "State" jerseys were merely prototypes shown off at an Adidas event, as they are the only ones that have not been in any photos shared by the university. It would make sense if the gray version was a prototype and that the white versions are the finished product. It's even still possible that all three looks (white "State", gray "State", all-black) will be worn, and that the "incorrect" comment referred to the inaccurate details on the black 85 mockup. We'll find out soon as the season gets underway. Other uniform possibilities in 2019 include the updated black 85 jerseys being worn with white or gray pants, the 2018 maroon M over S jerseys being retained, and the gray pinstripes returning for a fourth season. As mentioned in the previous section, it's possible that the black 85 jerseys will not be worn in the all-black combo in 2019, but instead could be worn with white or gray pants (and maroon or black hats). It'll definitely be interesting to see how they are used in 2019, after the all-black combo was worn in each of the last 10 weeks of the 2018 season. The maroon M over S jerseys, as discussed earlier, didn't look as good in 2018, with the Adidas logo directly above the M over S on the left chest. This resulted in them only being worn in two midweek games in 2018, and later as BP tops in the postseason. Given that they were already on the updated Adidas template, I think these are the only 2018 uniforms that could possibly be worn without changes in 2019. If they are worn, however, I would imagine it would be in a similarly small role to the way they were used last season. Lastly, the 2018 uniform style that appears most likely to be completely disregarded in 2019 is the gray pinstripes. Having been around since 2016, I noted in the 2018 season recap that the gray pinstripes were the most likely uniform to be retired in 2019. The gray "State" uniforms tweeted out by Kendall Rogers appear to be the replacements for the gray pins; while I won't 100% rule out the gray pins from returning in some fashion in 2019, I would be somewhat surprised if they did. To recap, 2019 may be the first time since the Bulldogs switched to Adidas in 2010 that no uniforms from the previous season are retained without any tweaks. 2015 was the most similar year in recent memory, when all uniforms were new except for the cream M over S jerseys, which were retained from 2014. The white 85s, maroon 85s, and white "State" pins will almost certainly be worn in 2019; black 85s and 50s-style white and gray "State" uniforms are also likely to be worn. With the presence of pinstripe and (probably) gray pants, it's likely that the maroon 85 jerseys will sometimes be worn with them in addition to the standard white pants. Other, less likely, uniform possibilities include the maroon M over S jerseys or an updated version of the gray pinstripes. Obviously not every weekend series has to feature the same exact uniform sequence; for instance, I would expect to see the three white jerseys (pinstripes, 85s, and 50s-style "State") rotated in and out on the weekends. Honestly, I'll just be happy if all-black isn't worn every single Sunday like it was at the end of last season. Ideally, black would be kept to the midweek (and maybe road Sundays) and with white or gray pants, but that seems unlikely at this point. In every single facet, 2019 has the potential to be an incredible year for Mississippi State baseball. Coming fresh off of the 2018 Omaha run, Mississippi State has a loaded roster, a brand new stadium, and an excellent set of uniforms that will continue to build the national brand that is Mississippi State baseball. Looking forward to an exciting season. Hail State.